VoodooDreams NZ Casino Review 2019 - $1000 Bonus + 200 Free Spins! For all the players who enjoy a more engaging and involved gaming experience, Voodoo Dreams Casino offers an excellent alternative. Instead of just playing games, the casino will let you accumulate your magic points, cast various spells, and challenge other players to exciting duels. Thanks to this, your Voodoo Dreams experience is taken to a completely new level, especially if you enjoy playing pokies like the majority of New Zealand players. You now have 20 free spins that are available to play on either Starburst, Joker Pro or Wild Wild West. VoodooDreams offer $1000 in casino bonuses + 180 Free Spins on Starburst over your 4 first deposits. Your casino bonus and 180 Free Spins on Starburst are credited instantly. Free spins have to be wagered 40 times. The maximum bet when playing with an active casino bonus is $5 per spin/hand. Voodoo Dreams Casino was first launched in 2017, making it one of the newer online casinos out there. Although fairly new, the casino ticks all the boxes in terms of safety and reliability, being licensed by the MGA and the UKGC. 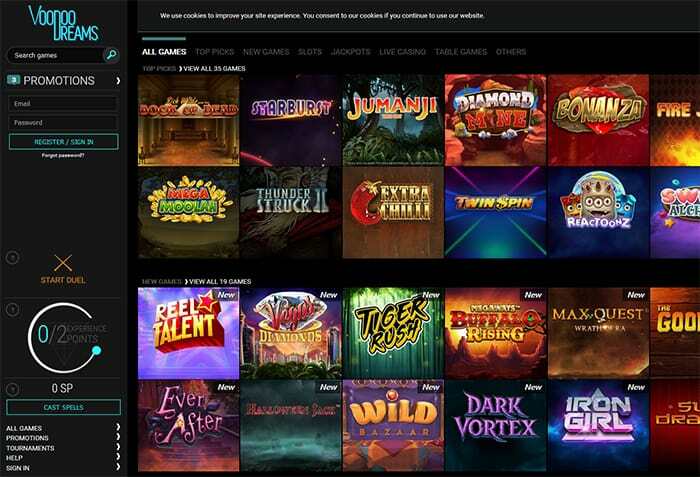 Voodoo Dreams Casino has a nicely designed and stylish instant-play site, but what really makes them stand out from the crowd is their approach to gaming. Namely, by playing on the site, players generate special Spirit Points, which can be used to cast spells. These spells will grant you different types of boosts such as bonuses and free spins, so the whole experience is much more engaging and interactive. Additionally, players can challenge each other to Duels playing their favorite slots. Duels let you select your strategy and, once a Duel starts, you’ll be dealing damage to your opponents while spinning the reels. Duels last for 600 or 900 seconds and can include two or four players, and the ultimate winner will get Spirit Points (alongside any winnings made while playing the slot, of course). As already mentioned, Voodoo Dreams Casino features a highly entertaining VIP program, where players are rewarded for their play with Spirit Points (SP). These points (which can also be won in duels) can then be used to cast various spells from one of four different groups (blood, dark, light, and spirit). There are also numerous levels players can advance through, with each level opening up new, more powerful spells from all categories. Everyone starts off as a Novice but as you progress, you can reach the highest levels – High Priest, Queen, and Oracle. It goes without saying that a modern casino such as Voodoo Dreams offers a pristine mobile experience. The site has been fully optimized for use with various mobile devices (iOS, Android, Windows) and players choosing to play on the go won’t suffer in any way. You can still enjoy all the games, gather points, participate in duels, and cast spells from your mobile phone or tablet. Players from New Zealand will be happy to hear that Voodoo Dreams Casino will let you deposit, play, and withdraw in NZD, which makes things easier in many ways. The minimum deposit and withdrawal limit is set at just NZD20, which makes casino accessible to everyone. Voodoo Dreams Casino offers standard support channels, i.e. email and live chat. Support agents are available around the clock so players should have no problems getting in touch in the event of any problems, concerns, or questions they might experience.